There comes a time when the strength and love you need can only be found in one place. Not in a thing, not in people but at the SOURCE! The author and the finisher of our faith: GOD! 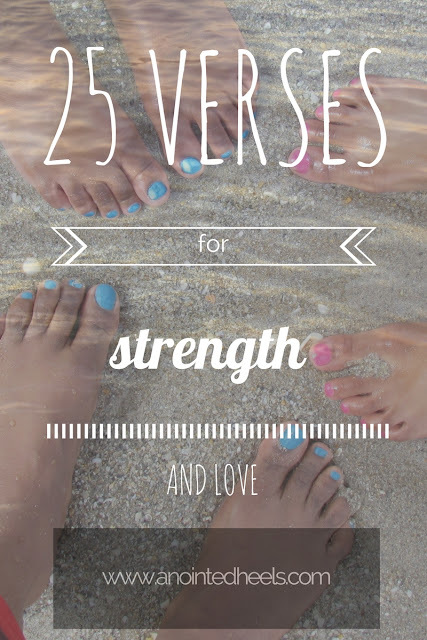 I have compiled a list of 25 reassuring Bible verses to help build strength and wrap you with LOVE! 1. I am complete in Him. 2. She is clothed with strength and dignity, and she laughs without fear of the future. 3. The Lord is my strength and my shield; my heart trusts in him, and he helps me. My heart leaps for joy, and with my song I praise him. 4. Be strong and courageous. Do not be afraid; do not be discouraged for the Lord your God is with you wherever you go. 5. When she speaks, her words are wise, and she gives instructions with kindness. 6. Don’t worry about anything, instead, pray about everything. Tell God what you need, and thank Him for all He has done. 7. God can do anything, you know—far more than you could ever imagine or guess or request in your wildest dreams! He does it not by pushing us around but by working within us, his Spirit deeply and gently within us. 8. Trust in the Lord with all your heart and lean not onto your own understanding. In all your ways acknowledge Him and He shall direct your path. 9. Blessed is she who believed that the Lord would fulfill His promises to her. 10. You are beautiful for you are fearfully and wonderfully made. 11. And do everything with love. 12. It is not fancy hair, gold jewelry, or fine clothes that should make you beautiful. No, your beauty should come from inside you –the beauty of a gentle and quiet spirit. That beauty will never disappear and it is worth very much to God. 13. Be strong. Be Brave. Be fearless. You are never alone. 14. Mightier than the waves of the sea is His love for you. 15. Perhaps this is the moment for which you have been created. 16. God is within her, she will not fall; God will help her at break of day. 17. Charm is deceptive and beauty is fleeting, but a woman who fears the Lord is to be praised. 19. Let the morning bring me word of your unfailing love. 20. You are loved more than you will ever know by someone who died to know you. 21. For I know the plans I have for you. 22. The Lord will fight for you, you need only to be still. 23. I will never leave you or forsake you. 24. You are altogether beautiful, my darling, beautiful in every way. 25. Whenever you feel unloved, unimportant, or insecure, remember to whom you belong.